by Chris Woodford. Last updated: May 13, 2018. Imagine living off nothing but coal and water and still having enough energy to run at over 100 mph! That's exactly what a steam locomotive can do. Although these giant mechanical dinosaurs are now extinct from most of the world's railroads, steam technology lives on in people's hearts and locomotives like this still run as tourist attractions on many heritage railways. Steam locomotives were powered by steam engines, and deserve to be remembered because they swept the world through the Industrial Revolution of the 18th and 19th centuries. Steam engines rank with cars, airplanes, telephones, radio, and television among the greatest inventions of all time. They are marvels of machinery and excellent examples of engineering, but under all that smoke and steam, how exactly do they work? Photo: A small, newly rebuilt steam locomotive working on the Swanage Railway, England. Great Western Railway 0-6-2 Tank 6695 was rescued from a scrapyard in 1979 and took 26 years to restore to full working order at a cost of £200,000 (approx US$400,000). What powers a steam engine? It takes energy to do absolutely anything you can think of—to ride on a skateboard, to fly on an airplane, to walk to the shops, or to drive a car down the street. Most of the energy we use for transportation today comes from oil, but that wasn't always the case. Until the early 20th century, coal was the world's favorite fuel and it powered everything from trains and ships to the ill-fated steam planes invented by American scientist Samuel P. Langley, an early rival of the Wright brothers. What was so special about coal? There's lots of it inside Earth, so it was relatively inexpensive and widely available. Coal is an organic chemical, which means it's based on the element carbon. Coal forms over millions of years when the remains of dead plants get buried under rocks, squeezed by pressure, and cooked by Earth's internal heat. That's why it's called a fossil fuel. Lumps of coal are really lumps of energy. The carbon inside them is locked to atoms of hydrogen and oxygen by joints called chemical bonds. When we burn coal on a fire, the bonds break apart and the energy is released in the form of heat. Coal contains about half as much energy per kilogram as cleaner fossil fuels such as gasoline, diesel, and kerosene—and that's one reason why steam engines have to burn so much of it. 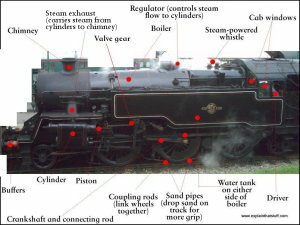 Photo: The main parts of a steam locomotive. Click the small photo to see a much bigger one. 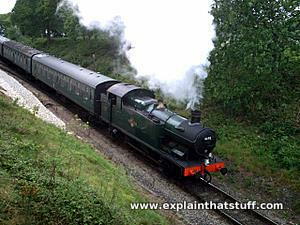 This is ex-British Railways Standard 4MT tank locomotive number 80104 (built at Brighton in 1955) working on the Swanage Railway, England in August 2008. Read how it was restored from a rusting heap and returned to service by its owners, Southern Locomotives, in 80104 Restoration. What is a steam engine? A steam engine is a machine that burns coal to release the heat energy it contains—so it's an example of what we call a heat engine. It's a bit like a giant kettle sitting on top of a coal fire. The heat from the fire boils the water in the kettle and turns it into steam. But instead of blowing off uselessly into the air, like the steam from a kettle, the steam is captured and used to power a machine. Let's find out how! A fire where the coal burns. A boiler full of water that the fire heats up to make steam. A machine attached to the piston. That could be anything from a water pump to a factory machine... or even a giant steam locomotive running up and down a railroad. That's a very simplified description, of course. In reality, there are hundreds or perhaps even thousands of parts in even the smallest locomotive. It's easiest to see how everything works in our little animation of a steam locomotive, below. Inside the locomotive cab, you load coal into the firebox (1), which is quite literally a metal box containing a roaring coal fire. The fire heats up the boiler—the "giant kettle" inside the locomotive. The boiler (2) in a steam locomotive doesn't look much like a kettle you'd use to make a cup of tea, but it works the same way, producing steam under high pressure. The boiler is a big tank of water with dozens of thin metal tubes running through it (for simplicity, we show only one here, colored orange). The tubes run from the firebox to the chimney, carrying the heat and the smoke of the fire with them (shown as white dots inside the tube). This arrangement of boiler tubes, as they are called, means the engine's fire can heat the water in the boiler tank much faster, so it produces steam more quickly and efficiently. The water that makes the steam either comes from tanks mounted on the side of the locomotive or from a separate wagon called a tender, pulled behind the locomotive. (The tender also carries the locomotive's supply of coal.) You can see a photo of a tender showing its water tank further down this page. The steam generated in the boiler flows down into a cylinder (3) just ahead of the wheels, pushing a tight-fitting plunger, the piston (4), back and forth. A little mechanical gate in the cylinder, known as an inlet valve (shown in orange) lets the steam in. The piston is connected to one or more of the locomotive's wheels through a kind of arm-elbow-shoulder joint called a crank and connecting rod (5). As the piston pushes, the crank and connecting rod turn the locomotive's wheels and power the train along (6). When the piston has reached the end of the cylinder, it can push no further. The train's momentum (tendency to keep moving) carries the crank onwards, pushing the piston back into the cylinder the way it came. The steam inlet valve closes. An outlet valve opens and the piston pushes the steam back through the cylinder and out up the locomotive's chimney (7). The intermittent chuff-chuff noise that a steam engine makes, and its intermittent puffs of smoke, happen when the piston moves back and forth in the cylinder. There's a cylinder on each side of the locomotive and the two cylinders fire slightly out of step with one another to ensure there's always some power pushing the engine along. Photo: Close-up of the piston and cylinder in a steam engine. 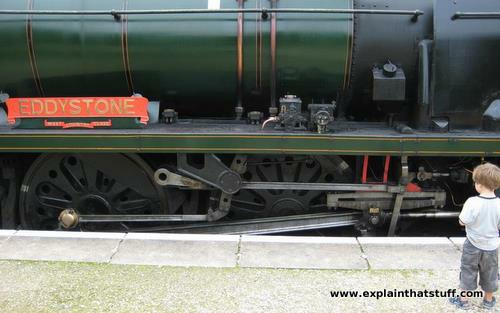 Our diagram up above shows a very simple, one-cylinder steam engine powering a steam locomotive down a track. This is called a rotary steam engine, because the piston's job is to make a wheel rotate. The earliest steam engines worked in an entirely different way. Instead of turning a wheel, the piston pushed a beam up and down in a simple back-and-forth or reciprocating motion. Reciprocating steam engines were used to pump water out of flooded coal mines in the early 18th century. 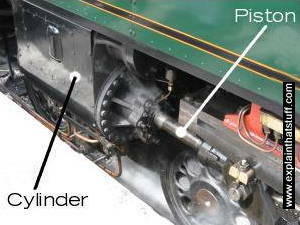 Our diagram shows steam pushing the piston one way and the momentum of the locomotive driving it the other way. This is called a single-acting steam engine and it's quite an inefficient design because the piston is being powered only half the time. A much better (though slightly more complex) design uses extra steam pipes and valves to make steam push the piston first one way and then the other. This is called a double-acting (or counterflow) steam engine. It's more powerful because steam is driving the piston all the time. If you look closely at the wheels of a typical steam engine, you'll see that everything is more complex than we've seen in the simple animation up above: there's much more machinery than just a single crank and connecting rod. In fact, there's an intricate collection of shiny levers, sliding back and forth with meticulous precision. This is called the valve gear. Its job is to open and close the cylinder valves at just the right moments to let steam in from either end, both to make the engine work as efficiently and powerfully as possible and to allow it to drive in reverse. There are quite a few different types of valve gear; one of the most common designs is called the Walschaerts, named for its Belgian inventor Egide Walschaerts (1820–1901). The tank engine 80104 shown in the second photo on this page has a Walschaerts-type valve gear, and so does Eddystone, the locomotive pictured below. Photo: The Walschaerts valve gear on a typical large steam locomotive, 34028 Eddystone. The first steam engines were very large and inefficient, which means it took huge amounts of coal to get them to do anything. Later engines produced steam at much higher pressure: the steam was produced in a smaller, much stronger boiler so it squeezed out with more force and blew the piston harder. The extra force of high-pressure steam engines allowed engineers to make them lighter and more compact, and it was this that paved the way for steam locomotives, steam ships, and steam cars. Photo: Steam engines could not carry all the water they needed for a long journey. Periodically, they would have to stop to refill at track-side water tanks like this one (above) on the Swanage Railway. Larger engines had tenders: trucks they hauled behind that held supplies of coal (in front of the red line we've drawn) and water (behind the red line). The coal rests on an angled plate inside the tender that makes it tip naturally toward an opening at the front where the fireman can easily shovel it into the firebox. Below: You can see what the tender's like inside on this unusual photo of an empty tender, photographed from slightly above and behind, taken at Think Tank, the museum of science in Birmingham, England. This tender holds about 18000 liters (4000 UK gallons) of water and belongs to the museum's City of Birmingham locomotive. Coal was a cheap and abundant fuel during the early Industrial Revolution, but the invention of the gasoline engine (petrol engine) in the mid-19th century heralded a new era: during the 20th century, oil overtook coal as the world's favorite fuel. Steam engines are extremely inefficient, wasting around 80–90 percent of all the energy they produce from coal. That means they have to burn enormous amounts of coal to produce useful amounts of power. A steam engine is so inefficient because the fire that burns the coal is totally separate (and often some distance from) the cylinder that turns the heat energy in the steam into mechanical energy that powers the machine. This design is called an external combustion engine because the fire and boiler are outside the cylinder. It's inefficient because energy is wasted as the heat and steam travel from the fire, via the boiler, to the cylinder. Gasoline- and diesel-powered engines are based on a totally different design called an internal combustion engine. The gasoline or diesel fuel is burned inside the cylinder, not outside it, and this makes internal combustion engines considerably more efficient. (You can read more about internal and external combustion in our overview of engines.) Oil has many other advantages too: it's cleaner than coal, makes less air pollution, and is much easier to transport in pipes. Photo: Some of the steam engines that run on heritage lines were still relatively new when they were withdrawn from service. This one, Bulleid Pacific No. 34070 "Manston," was built in 1947 and withdrawn less than 20 years later (in 1964). 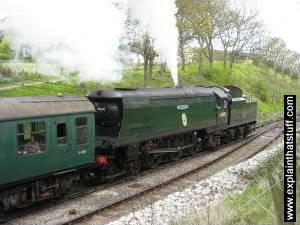 After a long restoration by Southern Locomotives, it returned to service on the Swanage Railway in September 2008. A wonderfully impressive sight, it weighs 128 tons and can reach speeds of over 160km/h (100mph). That's largely why steam locomotives disappeared from our railroads—diesel locomotives were altogether more convenient. It takes hours to fire up a steam engine before you can use it; you can get a diesel engine running in less than a minute. Steam engines disappeared from factories when electricity became a more convenient way of powering buildings. Who wants to load coal into a factory every day when they can just flick on switches to make things work? But things are not quite what they seem. Steam and coal never did disappear—not exactly. Where does the electricity we use come from? It would be great if it all came from renewable energy (wind turbines, solar panels, and so on), but much of it still comes from coal, burned in power plants miles away from our homes and factories. Inside a coal-fired power plant, coal is still burned to make steam, driving windmill-like devices called steam turbines, which are much more efficient than steam engines. As they rotate, they turn electromagnetic generators and produce electricity. So, you see, although steam locomotives have vanished from our railways, steam power is alive and well—and just as important as it ever was! Who invented the steam engine... and when? 1st century CE: Hero of Alexandria demonstrates a steam-powered spinning sphere called an aeolipile. 16th century CE: Italian architect Giovanni Branca (1571–1640) uses a steam jet to rotate the blades of a small wheel, anticipating the steam turbine developed by Sir Charles Parsons in 1884. 1680: Dutch physicist Christiaan Huygens (1629–1693) makes the first piston engine using a simple cylinder and piston powered by exploding gunpowder. Huygens' assistant Denis Papin (1648–c.1712) realizes steam is a better way to drive a cylinder and piston. 1698: Thomas Savery (c.1650–1715) develops a steam-powered water pump called the Miner's Friend. It's a simple reciprocating steam engine (or beam engine) for pumping water from mines. 1712: Englishman Thomas Newcomen (1663–1729) develops a much better design of steam-powered, water-pumping engine than Savery and is usually credited with inventing the steam engine. A Scottish engineer named James Watt (1736–1819) figures out a much more efficient way of making power from steam after improving a model of the Newcomen engine. Watt's improvements of Newcomen's engine lead to the widespread adoption of steam. 1770: French army officer Nicolas-Joseph Cugnot (1725–1804) invents a steam-powered, three-wheeled tractor. 1797: English mining engineer Richard Trevithick (1771–1833) develops a high-pressure steam version of Watt's engine, paving the way for steam locomotives. 1803: English engineer Arthur Woolf (1776–1837) makes a steam engine with more than one cylinder. 1804: American industrialist Oliver Evans (1775–1819) invents a steam-powered passenger vehicle. Like Trevithick, he recognizes the importance of high-pressure steam and builds more than 50 steam-powered vehicles. 1807: American engineer Robert Fulton (1765–1815) runs the first steamboat service along the Hudson River. 1819: Steam-powered ocean ship Savannah crosses the Atlantic from New York to Liverpool in only 27 days. 1825: English engineer George Stephenson (1781–1848) builds the world's first steam railway between the towns of Stockton and Darlington. To begin with, steam locomotives pull only heavy coal trucks, while passengers are ferried in horse-drawn carriages. 1830: The Liverpool and Manchester Railway becomes the first to use steam power for hauling both passengers and freight. 1882: The prolific American inventor Thomas Edison (1847–1931) opens the world's first commercial power plant at Pearl Street, New York. It uses high-speed steam engines to power the electricity generators. 1884: English engineer Sir Charles Parsons (1854–1931) develops the steam turbine for his high-speed steam boat Turbinia. Photo: Think of steam engines and you probably think of steam locomotives, but ships were steam powered too before diesel engines came along. 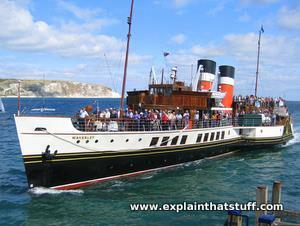 This one is the beautifully restored PS Waverley, the last ocean-going paddle steamer in the world, dating from 1947 and steaming into Swanage Pier in September 2009. Steam trains: Some wonderfully evocative TV and radio clips from the BBC. Flickr: Steam Powered: A Flickr group for steam-engine enthusiasts. Currently over 32,000 photos from around 1000 members. York, beyond expectation: A great description of the wonderful cutaway steam engine at the National Railway Museum in York, England. Steam Locomotive Operation: This is a great "virtual" guide to driving a steam locomotive using a RailWorks computer simulation of the inside of the cab. Steam train driving course at the Lavender Line: Watch a cab video of someone driving a steam train. There's no commentary and it's hard to know what the driver is doing, but you get a sense of how "physical" it is to drive a steam train! How Steam Locomotives Really Work by PWB Semmens and AJ Goldfinch. Oxford University Press, 2004. I've not read this one completely, but it looks quite good from the extracts I've seen. Quite detailed (348 pages) and with very much a British flavor. 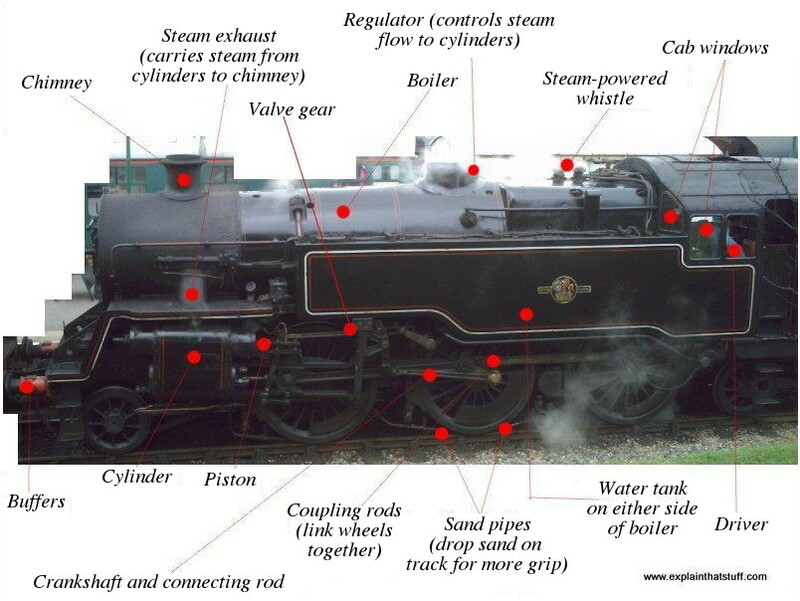 Steam Engines Explained by Stan Yorke. Countryside Books, 2009. A superb little book with fantastically clear illustrations of the different types of steam engines. A good starting place for people who don't want to go into the engineering nitty gritty in detail. The Way Little Engines Work (Thomas & Friends) by Chris Oxlade. Random House, 2017. A 48-page introduction for Thomas the Tank Engine fans (ages 5–7). Note that this book reuses content from the Haynes Manual Thomas The Tank Engine: 1945 onwards. The Great Railroad Revolution: The History of Trains in America by Christian Wolmar. Hachette, 2012. How the transcontinental railroads played a key part in shaping the United States. Fire and Steam by Christian Wolmar. Atlantic Books, 2008. A superb book about the history of rail in Britain. Wolmar is a passionate and knowledgeable transport journalist in the UK and the perfect person to write a book like this. Blood, Iron, & Gold: How the Railroads Transformed the World by Christian Wolmar. PublicAffairs, 2010. A follow-up to Fire and Steam, this explores how railways spread through other countries. The Duchesses, Aurum, 2015; The Flying Scotsman, Aurum, 2011; and Great Western Railway, Aurum, 2011, all by Andrew Roden. Three books written with a bit more passion and pace than Christian Wolmar's; I enjoyed all three enormously. Steam Engines: Great Inventions by James Lincoln Collier. Marshall Cavendish/Benchmark Books, 2005. A short history of steam engines for young readers. James Watt & The Steam Engineby Jim Whiting. Mitchell Lane, 2006. A biography of Watt for readers aged about 9–12. Magnificent Mallard: World's fastest steam locomotive: BBC News, July 3, 2013. A nostalgic trip back in time with Sir Nigel Gresley's unbeatable steam engine. O. Winston Link's Steam Locomotive Photographs by Matt McCann. The New York Times, November 16, 2012. Exploring the work of a famous photographer who documented the last years of American steam.